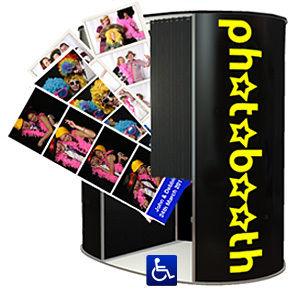 Fun Party Photo Booths for parties and weddings in Leeds, York, Harrogate, Bradford, Wakefield, Castleford, Pontefract, Dewsbury, Sheffield, Barnsley, Halifax, Huddersfield and surrounding areas. Q: Does the photo-booth take up much space? A: Our booth uses just 8' x 4' of floorspace although we need a little extra space for our set-up to accomodate a small table for props. Ideally we like a spot that's positioned close to the action, so everyone knows where we are when they're ready to strike a pose. Q: What does your photobooth look like? A: Our sleek curved booths look just like the one in the picture. Colours may vary depending upon availability. If required we can provide bespoke branding a reasonable extra cost. Q: Is your booth wheel chair friendly? A: Yes our booth has a wide opening on both sides to accomodate wheel chairs and large groups. Q: Will you need an electrical outlet and are you insured? A: Yes, we will need to be close to a power supply. We have full public liability insurance and our equipment is professionally PAT tested and risk assessed for your peace of mind. Certificates are available on request. Q: Will my guests get prints on the night? A: Yes we offer a range of print options from the classic picture strip up to postcard sized prints as standard. 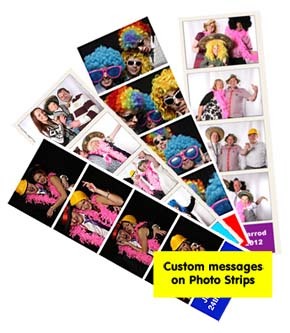 With the classic strip option we supply a duplicate in a guest book for your guests to sign as a memento of your event. Q: Does your Booth hire include video messages? A: Yes our Booths can provide either photographs or video messages selectable from the touch screen with the booth. Q: Can we upload the pictures to facebook? A: Yes we provide a password protected web gallery within 24 hours of your event from which you and your guests can upload pictures to facebook. Q: Are full size prints available? A: Yes your guests will be able to order a range of full size prints online through the password protected web gallery. At some events we are able to offer onsite printing if required. Q: Do we get a disc of the images? A: Yes we either provide disc or a usb memory stick containing all of the images at high resolution with a full copyright release. Q: We'd love to buy a photobooth for our friends as a gift, can we buy gift vouchers? A: Yes we do gift vouchers. Q: We have a couple of questions before getting started, can we call you to discuss them further? A: Absolutely. Please feel free to contact us.